AS A COMPANY PRONE to push new technology, no one outdoes Simms in fly fishing outerwear. It seems like every year they get the drop on competitors and introduce fabrics, zippers, styles and concepts that crop up as lower-priced features in the budget products for next season. It doesn’t mean they always get it right, of course, but year after year they bring fly fishers something to drool over. This year the premium entrants from Simms use GORE-TEX® Pro Shell, a new fabric from W. L. Gore that delivers a 10% reduction in weight, improved tear strength and abrasion resistance, and increased ease of movement thanks to the new backer fabric employed. The show-stopper use of Pro Shell for us was Simms’s new G4 Pro Jacket. At $449.95, you’d expect this jacket to do more than keep you bone dry in a hurricane, and Simms didn’t disappoint. Bellowed chest pockets with water-resistant vertical zippers are fronted with stretch tippet pockets (no more wondering where your tippet spools are). The large back pocket now also has a vertical zipper. They put extra-durable fabric on the top of the shoulders and arms and reduced the weight of the fabric in the body. There are other features of course, some of them available in their lower-priced jackets, but the muted orange and charcoal color combination sealed the deal for us. For 2008, Simms is also bringing out three other jackets: the more moderately priced Rivershed™ Wading Jacket ($279.95), the Windstopper® Softshell Jacket ($199.95), and last but not least, the Women’s GORE-TEX® Jacket ($379.95). This jacket is the first rain jacket Simms has made specifically for women, as part of their broader women’s line that includes new Gore-Tex wader and our first-ever women’s clothing. In designing their first women’s waterproof jacket, they decided not to “shrink it and pink it,” but instead developed a rain jacket from the ground up specifically for women, making it windproof and breathable with 4-way stretch for casting mobility and a soft, non-binding flannel lined interior. The coolest concept we saw in vests this year wasPatagonia‘s effort to redefine the form and function of their 20-something-year-old fly fishing vest. The new Guidewater Vest ($200) has the super-convenient oversized swept-zipper pockets that began to appear last year, and its main design characteristic — which you probably won’t notice until you put it on — is that it hugs the torso. Those design choices open up the vest to custom configuration, which can, depending on your organizational skills, be either good or bad. 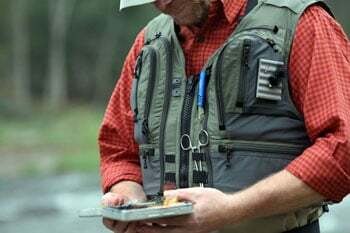 If you favor smaller, round-cornered fly boxes and pay attention to their location, the vest fits like a loose glove. But if you expect to import big, sharp-edged containers from your old vest and not feel them against your ribs, think again. Still, we like the freedom of choice, and I expect Patagonia will spend some time addressing any potential comfort issues in the next design phase. The best thing about the vest’s fit is that it doesn’t hang on the body like a set of grocery bags on strings. What that means is that that as you are water-hauling for distance in windy canyon somewhere your vest moves with you instead of cramping your style like a poorly fitted flak jacket. And thanks, Patagonia, for using a big plastic zipper instead of another “corrosion magnet.” Now if we could just convince everyone else to do the same. Patagonia is also introducing a very pleasing new version of its classic waterproof fishing jackets, also called the Guidewater. 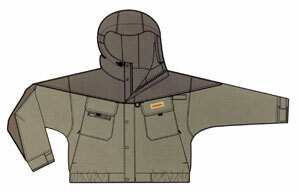 The new jacket ($400), which we consider an improvement over even the stretch version of the SST, uses more advanced fabrics and in addition to being long enough to cover the belt line, features several little design touches — a new drain system, vertical waterproof zippers instead of flaps, and a fleece lined collar that doesn’t wick moisture to the back of the neck — that show a lot about how seriously the company takes fishing jackets. Patagonia will also deliver a new modern version of the fabric hood that helped start the mask craze among Florida Keys guides. The new Sun Mask ($24), which is now a tailored tube of stretchable, breathable fabric, will come in blue, green, khaki and “Sea Creature.” Interestingly, like Simms, they’ve also chosen to attach a hood to a Sunshade-style shirt and call it a Sun Hoody ($60) (Patagonia’s hood is open in the face area, however, while Simms’s is a solid tube). Along with the new facewear comes a new line of long-sleeved 4.5 oz. polyester fishing shirts called Sun Shade Shirts, which are super-comfortable, fast-wicking, fitted with collars that extend beyond a normal T-shirt collar width for extra protection. Sun Shade Shirts with have a 30+ UPF rating. Read more here. Speaking of sun protection, Buff is offering both an entirely new line of headwear and an extraordinary new selection of patterns. If you fish saltwater, especially, the photographic fish scale prints are guaranteed to get worried glances from all those guys stealing your spots. (We liked the line-sided snook and the redfish patterns best, but the bonefish and tarpon versions are awfully nice too.) If you’re not familiar with the Buff product or with UV-protection face masks generally, take time to try one of the new products in their 2008 line. Beyond having the most complete selection of styles and colors among headwear makers, they’ve added a COOLMAX® Extreme product line. The new products promise to block 95% of UV rays, dry faster, and feel smoother on the skin than their Classic line, which provides more thermal protection. Fishpond gets the nod this year for style intelligence. Their new Firefly Women’s Fishing Vest ($129) and Wildhorse Tech Pack — a high-capacity vest/backpack combo — are both very functional and pleasing to look at. Redington has a wonderful habit of cherry-picking useful design features and incorporating them into highly effective apparel and outerwear. 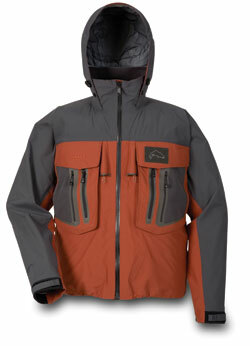 A good example is their new Stratus II wading jacket, a waterproof, breathable jacket that comes in at only $130. It also has neoprene cuffs and generous storage pockets in both front and back, as well as an interior zip security and sunglass pocket. We also like the changes they’ve made in their sun-protective clothing line. 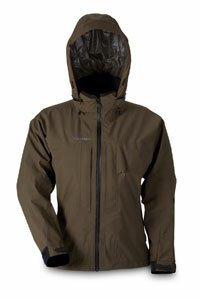 And Redington’s new waterproof Hunter River wading jacket is a steal at $55. In the company’s shirt line, we liked the new Wildfly II crew neck, which has the same generous collar everyone seems to want to stuff under a mask and which delivers 30+ UPF sun blocking for only $35. And the Campbell River II Tee ($25-30) is probably the most comfortable technical t-shirt we’ve ever tried on. 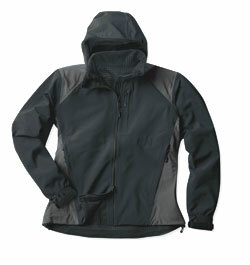 Among its new apparel, Orvis has two new waterproof stretch-fabric jackets that are quite nice looking. The $229 Tailwaters Stretch Jacket includes many features found on higher-priced competitors’ products plus a rather unique cuff system designed to let you dunk your forearm in water and not have water enter your sleeve. The $198 Waterproof Stretch Rain Jacket is a an ultra-light waterproof shell that is very smartly styled. Ex Officio is doing more “green gear” for 2008, including a line soy-based and recycled polyester products. 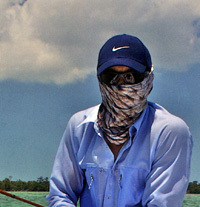 But their fly fishing apparel focuses on air circulation and, in partnership with Buzz-Off™, insect shield technology. The new Halo Ultralite Nylon shirt is probably the best example of a Buzz-Off-treated product for those concerned with both insect and sun protection. Of the products being demoed at the FFR show, the new ExHale shirt was the one that caught our eye. Made of UV-blocking ripstop nylon, the ExHale has welded-in blocks of ventilation screening beneath the arm and on the sides. Under Armour ditched the semi-military styling of some of its first hot weather, UV-blocking shirts from last year (thank goodness) and is going with a softer look in its body-fitting Tilghman Knit Shirts and more classic Riverguide II short- and long-sleeve products (all $80-90). Their new Flats Guide shirts also have an interesting look provided by two extra-large chest pockets. Finally, Chota has added a new Ultra-Light Pullover to their CVX2 line of rainproof/windproof jackets. They’re also introducing a new windproof reversible fleece micro-fleece vest.